● We offer as an automated process system, such as from supplying effluent into treatment container to sterilizing and cooling water discharge after sterilizing. ● We used stainless (SIS316) for treatment container body, and consequently you can use it with confidence for long periods. And, it is also possible to make titanium body for seawater and pH unstable effluent. ● Treatment capacity can be changed depending on customer’ s applications such as from small size of 20 liter to large size of 500 liter. 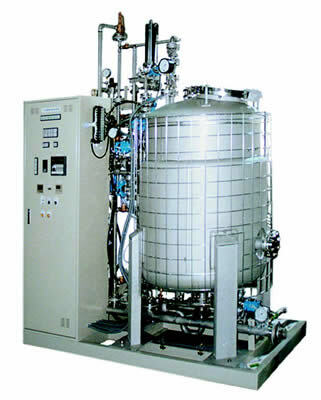 ・Sterilization of wastewater from biohazard facilities (such as genetic modified organism, etc.) and medical facilities. ・Treatment of wastewater which includes pathogens and cells of animal and plant. ・Treatment of various wastewater from food, medical facilities, etc. ※All this equipment will be customized. Please contact us for specification, price, etc.